Well, New Years Eve 2014 has come and gone, and what do we have to show for it? Photographs, of course! The company behind the annual Space Needle New Year’s Eve fireworks spectacular promises the ‘biggest and best’ show ever. 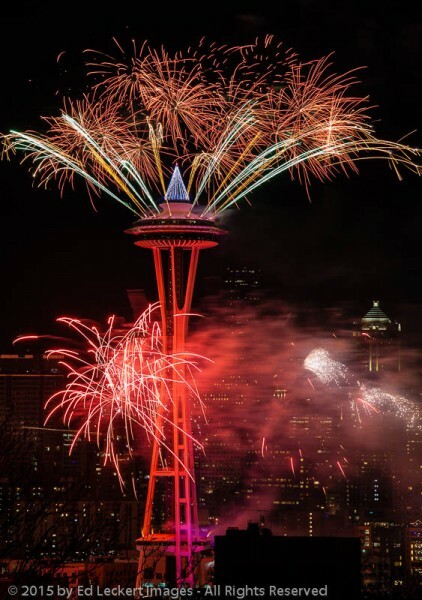 Crews from Sacramento, Ca.-based Pyro Spectaculars have been scaling the Space Needle since Monday, rigging up thousands of pieces of pyrotechnics on virtually every nook and cranny of the Needle, says Ian Gilfillan, executive vice president for Pyro Spectaculars. “We’re always trying to come up with some new looks and new ideas for the show. I think it’s going to be the best yet,” he says. Huh. Well, I’m not going to call the show “lame”, exactly. That’s a bit unfair. Short, perhaps. In fact, that may have been the shortest eight minutes of my life, made more so by the fact that I stood in the cold for four hours before the show. You read that right. You see, arguably the best spot in Seattle to view the Space Needle is from Kerry Park, a public park conveniently placed on the south side of Queen Anne Hill overlooking the city. 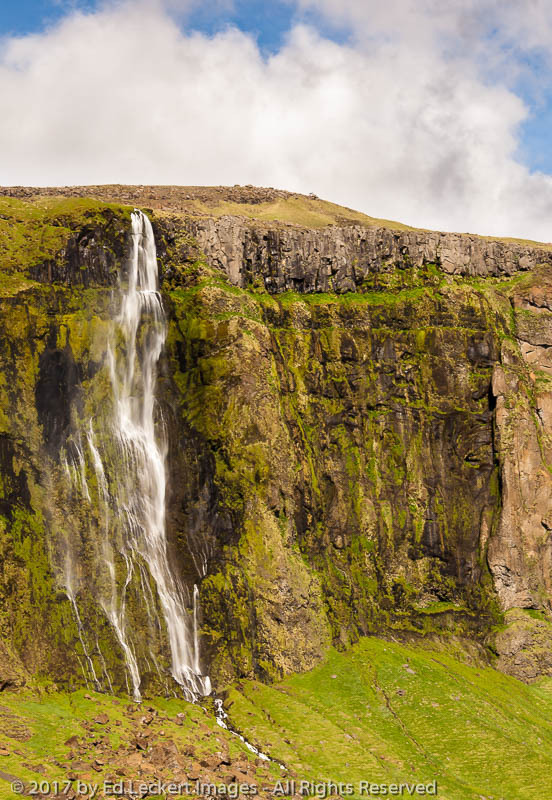 Now, the best spot to view anything is always going to attract photographers and spectators. But add the constraint of an eight minute event, and now everyone who’s interested has to cram their visit into this very short time span. And what that means is that if you want a good spot with an unobstructed view, you need to get there early. Very early. I left my home in Issaquah at about 7:15 PM, not knowing what kind of traffic problems to expect. (In Seattle, you should always expect the worst.) I avoided the area near the Space Needle by a wide margin, parked about a half-mile from Kerry Park, and arrived there just after 8 PM. I was wearing four layers of clothing from my long underwear out to my PrimaLoft® jacket, plus a hat and gloves and two pairs of socks under my hiking boots. It was 27°F and clear, about 10 degrees below normal. It was going to be a long night. As expected, even at 8 PM there was already a line of tripods set up in the prime spots, along with a dozen or so locals and tourists flashing selfies with camera phones. (Why doesn’t the WordPress spell-checker know about “selfies”? What’s up with that?) No worries, though, there was still plenty of space. I decided to position myself beyond the fence, in front of a row of the early arrivals, and shoot from near ground level so as not to be in the way of the guys behind me. There was a steep drop-off in front of me, so I assumed no one would be in my way, even with my low vantage point. 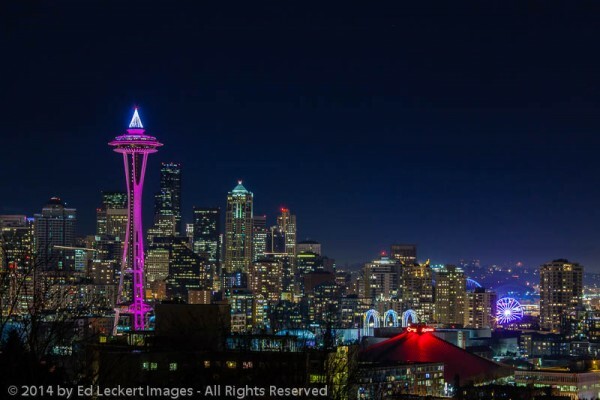 The Seattle skyline at night on New Years Eve features the tree of lights atop the Space Needle and the ferris wheel on the pier, in Seattle, Washington. At one point, a young guy with a brand new low-end DSLR (Digital Single Lens Reflex, what I use minus the “low-end” part) walked up and asked if Jeff and I could show him how to use his camera. Seriously? No, I said. You need to get out the manual and go out and practice when it’s not so dark that you can’t see the controls. Then do some reading or take some courses. And if you had bothered to do even the most basic research about shooting fireworks or cityscapes at night, you’d know you can’t do it without a tripod! Jeez. As 2014 wound down, the crowd picked up. They filled in from the fence all the way back to the street. They filled in the space in front of me and down the steep hill. The ones in front were standing, blocking not only my view but the guys behind me with fully extended tripods. We were afraid it might get ugly, but at about 10 minutes before midnight, everybody sat down in the cold, wet grass without being asked. Whew! 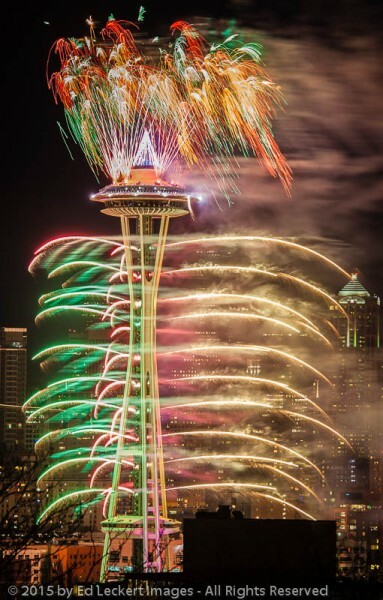 The Seattle Space Needle spews flames from every conceivable location during the 2015 New Years celebration, in Seattle, Washington. Then, ten seconds before midnight, it started. The show, launched entirely from the Space Needle itself, began with a countdown to midnight along the length of the support structure. Then at midnight, all hell broke loose. The Space Needle spewed rockets and flares from every conceivable spot. There were probably some oohs and ahs, but all I heard were the shutters of all the cameras clicking around me. For eight furious minutes, I attempted to capture that perfect display of light and color. This is harder than it looks, because to get a really great display you need to leave the shutter open for a period of time, allowing multiple bursts to expose a frame, and you can’t really predict what’s coming next. At least that’s how it’s traditionally been done. You could also now with digital photography take shorter exposures and plan to combine them in postprocessing, but that’s not the approach I was planning to use. 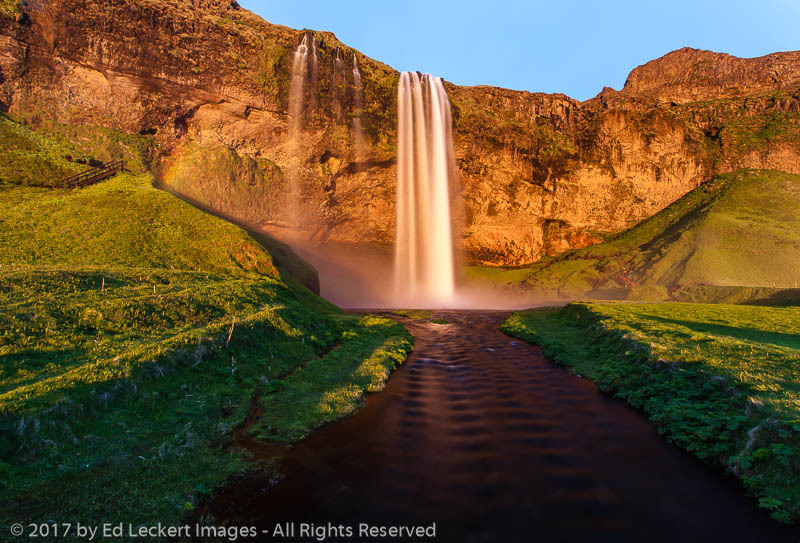 My approach was to shoot as much as possible, varying the length of exposure between about one and six seconds, and hope for the best. I also didn’t know how far out the bursts would go from the Space Needle, so I had to constantly re-evaluate the zoom level to make sure I didn’t chop off part of the show. 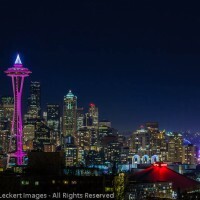 Fireworks shoot from the Seattle Space Needle to welcome 2015, in Seattle, Washington. And in a flash, it was over. People sat there in disbelief. Is that all? Then they checked the time. It was almost eight minutes after midnight. Yep, that was it. It’s over. Time to pack up and go home. So was it worth the wait? I suppose so. It’s nice to have some fireworks images in my portfolio, even though I know I could do better. Which brings up the question, would I do it again next year? It’s easy to say “no”, it wasn’t worth the effort. But come next year, you know I’ll be considering it. And there’s July 4th to get through, too, which is an entirely different experience – different locations, earlier, warmer, probably longer and more choices. So yeah, I suppose I’d do it again in some fashion. 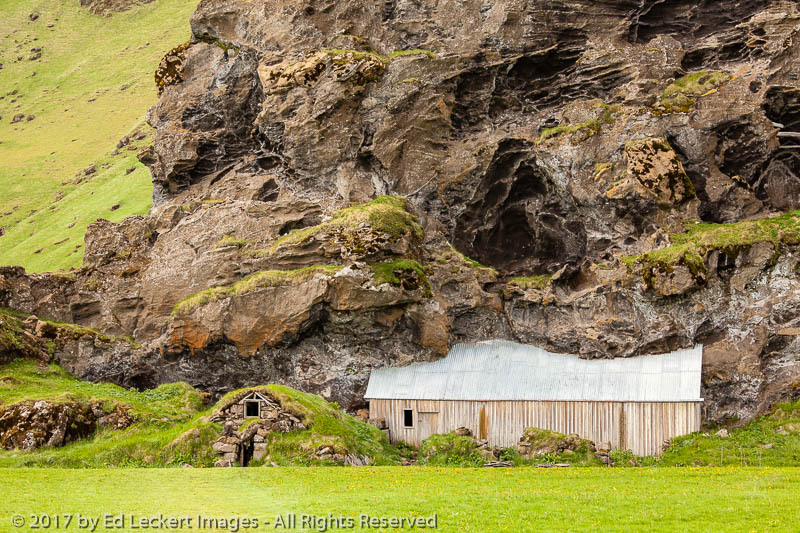 So I packed up my gear and headed north, away from the crowds. I ran into nothing more than the usual Wednesday night traffic and was home shortly after 1 AM, wondering if I had any good images, but also thinking about that volunteer trail work with Washington Trails the next morning that forced me to set the alarm clock for 6 AM. Hey, at least I was now warm, and unlike a lot of my friends, sober and not having to worry about how to get home. Maybe a fireworks shoot wasn’t such a bad idea after all!